Smith Rock State Park is near the communities of Redmond and Terrebonne, about 26 miles northeast of Bend. Its scenic views of deep river canyons and sheer cliffs of tuff and basalt make it a destination for adventurers of all kinds, especially rock climbers. Generally considered the birthplace of modern American sport climbing, Smith Rock is host to hundreds of cutting-edge climbing routes. With miles of hiking and mountain biking trails, you might also see golden and bald eagles, prairie and peregrine falcons, mule deer, river otter, and the occasional beaver. Due to the uniqueness and fragile aspect of the park, the rangers enforce the animal leash law and strongly encourage all park users to stay on trails due to erosion that is a result of traffic on the high desert ecosystem. For camping, there is a walk-in bivouac area for tents that are available on a first-come-first-serve basis, and RV camping, sleeping in vehicles and open fires are not allowed. Parking permits are $5 per vehicle/per day, and annual passes are also available. If big, bold beautiful rocks near water make you ooh and aah, then Smith Rock State Park’s towering hunks of golden red volcanic rock crags jutting up from a windy river canyon will leave you with a loss for words – and maybe a couple of exuberant oohs and aahs thrown in for good measure! This mother-nature-out-did-herself sort of place and natural attraction sits ​30 minutes from Bend, Oregon outside of Terrebonne. It was recently named one of the 7 Wonders of Oregon, according to Travel Oregon, the state’s travel commission. But we always knew it was a magical place for hiking and trail running, biking, rock climbing, and even fishing long before this claim to fame. Even Hollywood has featured the park in numerous blockbuster movies. In fact, an image of Smith Rock – with Reese Witherspoon in the foreground – has been circulating for the film, Wild, based on the popular book written by Cheryl Strayed on her real-life journey along the Pacific Crest Trail. The Pacific Crest Trail doesn’t actually come anywhere close to Smith Rock State Park, but it sure makes a pretty photo op for movie promotions. While you are visiting Central Oregon, take a day out of your vacation to explore every nook and cranny of this 651-acre majestic state park. We are pretty sure it will top the list as one of your favorite places in Central Oregon. Smith Rock offers year-round hiking. Fall, winter and spring days offer ideal hiking weather at the park. Smith Rock is one of those hiking spots where you can find dry ground during the winter months in Bend. You can opt for an easy 2 ½ mile stroll on flat ground with plenty of scenic rock and riverfront views by taking the River Trail from the park bridge around to Monkey Face – a 350 foot pillar of rock that resembles a monkey’s face. Or you can take the short cut, a 2/3 of a mile steep hike up the Misery Ridge Trail (elevation 3,360 feet) for out-of-this-world views including the entire Central Oregon Cascade mountain range. A favorite 4-mile hike is to start on the River Trail towards Monkey Face then ascend the Mesa Verde Trail up to Misery Ridge and back down to the footbridge ending at the parking lot. With the opening of the Summit Trail loop, hikers can now get in an 8-mile round trip walk. There are plenty of other trails to tackle each with its own unique views of the Cascade mountains, rock cliffs and the Crooked River, so kick off your #52HikeChallenge at Smith Rock. Sport climbing at Smith Rock is world-famous. In fact, the Just Do It route on the east face of Monkey Face is Smith’s hardest route and was the first 5.14c rated route in the U.S. Almost every day of the year, you’ll spot rock climbers scaling this and thousands of more bolted routes (1,800 climbing routes and counting!) along the smooth basalt rock walls with fall and spring being the most popular months. Winter can be chilly some days and the summer can be blazing hot (hot enough to melt your shoes to the rock!) unless you plan your climbing near dawn or dusk. There are plenty of fun climbs ranging from easy to unequivocally insane. If you’re a beginner, there are plenty of climbing guides and outfitters who operate at Smith Rock. They’ll provide all the equipment and show you the ropes until you get the hang of it. If you’re a pro, then plan to stay – and climb a while. Smith Rock isn’t what we would call a mountain biking mecca much like Phil’s Trail or any of the trail systems sitting between Bend and Bachelor, but Smith Rock offers some fun trail riding, especially during the winter months when higher elevation trails are snow covered. Mountain biking trails at Smith are not recommended for beginners – or the out of shape – due to the steep hill climbs and rocky descents. The Summit Trail is an intermediate strenuous trail with a little bit of everything – switchbacks, singletrack, rocky roads, and a few drop offs that’ll make even those without a fear of heights cringe a little. The Grey Butte Trail that connects to the Summit Trail is the best way to start this entire 7-mile ride with less hill climbs, but it requires a shuttle vehicle since you’ll start at Grey Butte Trailhead located off forest service roads from Lone Pine Road between Terrebonne and Madras. The Oregon Scenic Bikeway state designated cycling route along the Three Sisters Scenic Bikeway features an incredible 37-mile ride to and from the town of Sisters to Smith Rock. On the way, you’ll cruise past pine forests, fields of desert sagebrush, and the Deschutes River with plenty of dramatic views along the entire route. This slow stretch of the Crooked River offers more than just a pretty picture. It’s responsible for sculpting the landscape of Smith Rock you see today. We’ll save the geological activity facts for you to read at the park or experience during the Oregon Archaeology Celebration events every September and October. The river continues its course from here through the grasslands before joining the Deschutes River and the Metolius River at Lake Billy Chinook. Fisherm​en flock to the upper areas of the Crooked River (below Prineville Reservoir and above Smith Rock State Park) for some of the region’s best fly fishing, but this stretch of river through the park is packed with a few fishing surprises. Open to angling and fly fishing (check current regulations), the Crooked River offers up the opportunity to reel in plenty of trout. If your hook is small enough, you’ll find yourself catching more mountain whitefish than you know what do with. They put up a good fight, are quite tasty when smoked, and are actually a close relative of the trout. The Canyon Trail and Homestead Trail are designated for horseback riding at Smith Rock, but you’ll have to share the trail with mountain bikers and hikers too. Load your four-legged friend in the turn-around parking area and descend into the canyon on the Homestead Trail or park on the north end of the day-use parking lot and take the Canyon Trail down for a scenic riverside ride for a little over a mile. The 1-mile Homestead Trail has a horse ford river crossing with an opportunity to connect to the Burma Road Trail and then onto the Grey Butte Trail in BLM land which makes for a much longer ride. Tons of wild animals and birds of prey love this area as much as we humans do. You’ll often see falcons flying, fish leaping, otters playing, dogs swimming, and deer grazing. The river attracts a variety of birds and nesting geese all year long. Please respect the seasonal closures around parts of the park to protect fragile nesting areas and be on the lookout for rattlesnakes during the warmer months. Look for special interpretive presentations and events for adults and kids – some with live reptiles and animals! During September and October, the park features special presentations and activities for the Oregon Archaeology Celebration. If you find yourself loving Smith Rock as much as we do, consider donating your time during the Spring Thing every May where volunteers repair fences, build steps, and clean chalk off climbing walls. Stay for the burrito dinner, evening yoga, and the raffle where you can bid on some really good stuff. 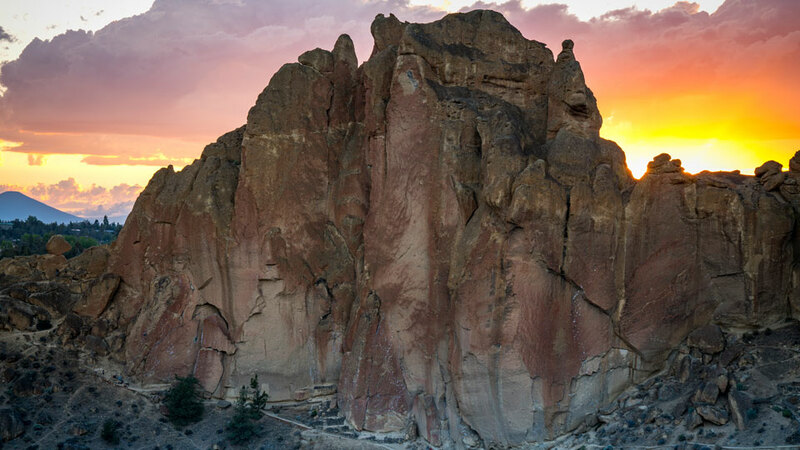 Since Bend is a trail runner’s kind of town, you’ll find a few stunning trail running races at Smith Rock every year. In May, the Smith Rock Ascent and the Smith Rock Half Marathon and 10K offer a back-to-back event for serious runners, walkers – and even kids – with plenty of options for distance and terrain ranging from a 50K race to a 4-mile trail race to a fun run for the kids. Limited camping is available in the bivouac area at Smith Rock. Tent sites are available with a common shower, restroom, and cooking area. RV sites are not available and sleeping in your vehicle is prohibited and strictly enforced. If you need a place to park your RV, check out our list of RV and camping spots throughout Central Oregon. There are plenty of off-leash areas in and around Bend, but Smith Rock isn’t one of them. Dogs need to be leashed at all times or you’ll risk getting a citation from park officials. Trust us – they’re quite strict about it. It’s also a good idea to keep your dog on a short leash, which offers more control when hiking down steep slippery terrain. Rattlesnakes are prevalent so a short leash is recommended to keep your dog on the trail and out of the brush. The Burma Road Trail, which takes you out of the official park and into BLM land, is a fun hike if you and your dog want to enjoy Smith Rock leash-free. Either way, keep your dog with you and out of the car. It can get quite warm here with all of our bright sunlight radiating off the rocks. This attraction requires an Oregon State Park pass for parking at Smith Rock. You can purchase a one-day pass at the park for $5 (cash or credit/debit cards accepted at the fee station). Consider purchasing an annual pass for $30 because you may just want to come back again and again. Annual passes are available at the Bend Visitor Center. We saved the best for last ​. . . dessert! Reward yourself after a hard day of climbing, hiking, bike riding or sightseeing with a homemade huckleberry ice cream cone from Juniper Junction aka Rockhard. Some say the ice cream is better than Portland’s famous Salt and Straw – you’ll have to be the judge!